I am new to this, I'll be the first to admit it. I am not talking about blogging though. If you check my Blogger profile, it says I've been at it since 2008, and I've written four blogs since then. I mean I am new to action. That is, getting up and doing something real to make a difference. This is the first time I am really putting my money where my mouth is. Well, its better than that frankly. Since I don't have a lot of money, I am using my time and organizing talent to make a difference in someone's life who really needs it. Have you just sat and watched opportunities to help drift by, untouched? Have you ever watched as someone tried to liberate that heavy grocery cart from the group that just would not...let...go? Or have you walked behind someone struggling to carry a heavy bag while holding a plant, a purse, and the hand of a small child whose inner compass seems to be pointing in the opposite direction? Have you ever let slip by that opportunity to say, "let me help you?" I know I have more times than I can remember. Sometimes I hesitated to interfere. Other times I feared rejection or embarrassment. But not volunteering a "yes, I'll help," just left a sad empty spot in my heart. This time, I am putting my anxieties and feelings of fear on the top shelf and I am reaching out. It was scary to take the first step. So I prayed. It was terrifying to press that "send" button. So I asked for strength and courage. My head was filled with doubt and I had half convinced myself that "people wouldn't care." So I pleaded for a little bit of hope and faith. And then I closed my eyes, held my breath, and stepped off. I pushed that "send" button knowing that even if my appeal for help was turned down, the One up there was still going to love me. And you know what? My initiation was met with lovely real-life enthusiasm and heart. Whew, I could just hear my heart give way to a beautiful wash of relief. That is what happened when I contacted The Giving Heart. 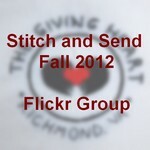 I found them through WeAllSew.com and I noticed that they are located near to me in Richmond, Virginia. The Executive Director, Vicki, surprised me by responding to my emailed within an hour and asking me to give her a ring. I did promptly and was delighted to hear about her work, the group's wonderful mission, and success stories. Located near Richmond, Virginia, The Giving Heart is a 501(c)(3) non-profit dedicated to providing food, fellowship, and living essentials to those in need. The elderly, homeless, and families who have come upon hard times, are welcomed by the generosity of more than 500 volunteers who run the Annual Thanksgiving Feast, which feeds the bodies and souls of more than 3000 guests. The all-volunteer-staff also lead their Giving Bag and Got You Covered programs. To date, more than 4,000 needy individuals and families have received Giving Bags made of reusable materials and filled with toiletries, diapers, non-perishable food items, blankets, and hats, scarves and mittens. And over 400 individuals have been given clothing, including professional attire, through the Got You Covered program. Vicki told me their aim is to create a strong, loving community that supports one another. The Thanksgiving Feast, held at the Greater Richmond Convention Center, attracts the largest volunteer waiting list! She told me they have more who wish to volunteer than capacity. I said, "its time to grow!" So you ask, how can I help? What does crafting have to do with a The Giving Heart's Thanksgiving Feast? It has everything to do with it! I personally, am gathering, creating, and giving reusable bags for their Giving Bag program. Do you have a reusable bag you'd like to donate? Can you sew a sturdy cloth tote to carry the essentials they give out at their event? I am asking everyone I know for help. These donations don't require a lot of cash, or maybe any at all. Maybe you have some duck cloth in your stash, enough left over to bang out a quick tote bag. Maybe you have a friend who loves to sew and would like to help. Maybe you have an extra cloth grocery tote you'd like to give to someone in need. If you can help let me know! (abbieipark(at)gmail(dot)com is a great way to contact me. Or find me on FaceBook or Twitter.) No donation is too small. Send me one bag. Send me many. Your gift is needed. And your time is appreciated by the hands and the heart that receives your bag. If you don't sew, but you are in love with yarn, The Giving Heart also accepts hats, mittens, and scarves for men women and children. Winter is coming and they include these bits of love in the Giving Bags too. If you'd like to get involved in other ways, and they are glad to accept donations of a variety of items, visit their web page or call their offices at (804) 749-4726 for more information. It is so difficult to get over that bump and move from being someone who wants to help, to someone who will help. But I believe in faith, hope and love.I love hearing the gratitude in someone's voice. I have faith that there are others out there like me, who want to help. And I have hope that they will take action and make a difference.